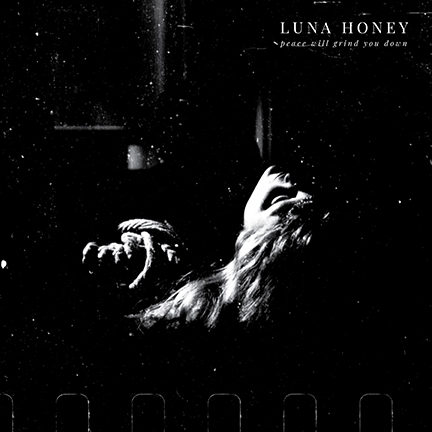 Luna Honey draws on influences from The Birthday Party, Morphine, Carla Bozulich, Swans, and early 4AD to combine murky bass grooves, unhinged distortion, and haunted vocals for a sound that builds from darkly hypnotic to feverishly unmoored. Their songs examine what it means to grow older, to let go of guilt, to embrace fear, and to find the balance between safety and a meaningful existence. Luna Honey’s first LP, “Peace Will Grind You Down” was released July 13, 2018 on BLIGHT.Records on vinyl, cd, and streaming. Luna Honey’s debut album was released 7/13/18 on BLIGHT.Records. It started as a studio project of Maura Pond and Levi Flack and was produced by Benjamin Schurr. Available on vinyl, cd, or download. Stream now on Bandcamp, Apple Music, or Spotify. Recorded in two live sessions in studio and released on cassette by BLIGHT.Records on 9/21/18, “Peace Lives” features the live versions of songs from “Peace Will Grind You Down” as well as two previously unreleased tracks. The tape captures the raw energy of Luna Honey’s live performance and documents the sound of the group with it’s current lineup. Luna Honey was formed on vocalist Maura Pond and bassist Levi Flack’s honeymoon in Colombia when the couple decided that they should spend the first year of their marriage dedicating themselves to something both had always wanted to do- putting out a full LP of original music. That dream became a reality in April of 2017 when they befriended music scene veteran Benjamin Schurr at a Br’er show at DC’s Black Cat. While waiting in line together for a Nick Cave show they had road- tripped to Philadelphia for, Schurr made an impassioned speech on the duty of the artist to work with what you’ve got to create whatever original and meaningful art you are capable of. Inspired by those words to try and overcome the feelings of inadequacy as a musician that had kept her from finishing songs for most of her life, Pond set about writing an album to help process what it means to be reexamining yourself in your 30’s and weighing what accumulated burdens help ground you and keep you steady, and what just weigh you down and should be cast off. On a Friday the 13th in October that was also the release date for Schurr’s “Brunch is for A$$holes” LP with Br’er, as well as Maura and Levi’s anniversary weekend, the three spent several frenetic days in Maura and Levi’s house in Anacostia, DC recording the bulk of the songs and fulfilling the pledge made a year before. Looking to translate the energy of the recordings into a live set, Luna Honey added baritone sax player Madeline Billhimer in February 2018. Though coming from a strong music background, Luna Honey is also Billhimer’s first band and represents a turning point in her career as a musician. Together, the group is eager to spread their gospel of confronting that things that scare you, and seeks to embody the possibilities of what you can achieve when you surrender your ego and open yourself up to other people and ideas. We respect your privacy. We won't sell your information to Cambridge Analytica, or anyone else. Thank you! You can also keep tabs on what we're doing on Instagram or Facebook.